Flowers always make people better, happier and more helpful. They are sunshine, food and medicine for the soul. 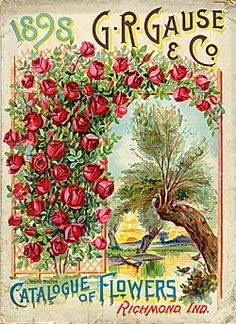 Dear little vintage seed packets and cigarette cards with flowers and fruits and vegetables on are wonderful things. Firstly if you have some yourself you can use than in mixed media work by stitching them on to beautiful fabrics ( this would be something not needing washing at all, like a picture behind a frame) You could of course use decoupage on something you loved. 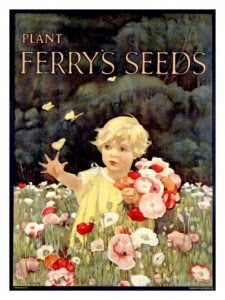 The picture above is of two little vintage seed packets that I have... they are dear little things. Why can't they make them like this any more!! The results have been fabulous. You can photocopy them onto special papers and then use then. The paper that you can iron onto fabric and the one that you wet and slide onto furniture say (The inkjet water slide Decal paper). You can buy these papers on Amazon on line. If you do not have any little seed packets then you can Google them on line in images, The statute of copy right is 80 years so most you are able to download to your computer and use. At the weekend I am going to get my design book out and have a go at project I have in mind for some of these beauties. Also giving the Decal water ones a go as well... I have just the thing for them. You can also print directly onto fabric by backing it with freezer paper; this saves the problem of writing being back to front! Yes you can indeed....Thank you I forgot to mention that in the blog. I love it when my readers contribute. Nicotine is a compound found in tobacco leaf, the primary fixing in cigarettes and is said to cause enslavement and illness in cigarette smokers, (World Health Organization (WHO)).